It was late summer in 2003. 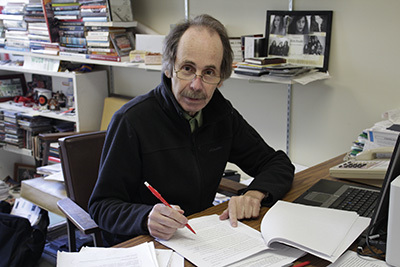 An opinion piece in a Long Island publication no longer in print by a man named Richard L’Hommedieu caught the eye of Stony Brook professor Norman Prusslin. L’Hommedieu had just come from a trip to Georgia and visited the state’s music hall of fame while there. In his article, he pondered about the possibility of one on Long Island, and said he thought it was time the region had a music hall of fame of its own to recognize its great many talented performers. Prusslin agreed. After emailing L’Hommedieu and introducing himself, the two organized a meeting in the Dean’s suite in the Student Activities Center at Stony Brook University. The two men invited people who they thought would be able to contribute to this organization—concert promoters, musicians, an attorney, a producer, a writer. And the group of 15 or so sat to discuss what this idea could become. Ten years later, the Long Island Music Hall of Fame has become a nonprofit organization that has inducted such musicians as Louis Armstrong, Cyndi Lauper, LL Cool J, Mariah Carey and Billy Joel; it gives music students scholarships to help with their continuing education; and is working to establish a museum of Long Island music history. 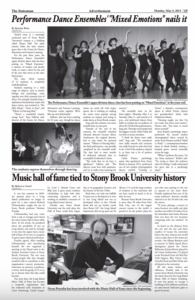 Prusslin says Stony Brook University was the only place the Hall of Fame could have begun due to its geographic location and the history of the late 1960s. Back then, not only was Suffolk County not as developed as it now is, but Long Island was not as developed either; in fact, Nicolls Road did not go further south than Route 347, the Long Island Expressway did not go past exit 56 (Route 111) and the large number of students at the university did not have nearly as much to do as they do now. The Statesman published this piece in print on May 06, 2013. Because Stony Brook University is more than 50 miles from New York City, one of the largest concert venues in the world, it proved to be the perfect place for acts who were playing in the city to squeeze in one more show. Prusslin explained how one of the music industry’s theories, casually referred to as the 50 mile rule, was the reason. “If you’re playing a concert in some location, you really can’t play another one within 50 miles of it in the immediate time frame. Because then you have the two locations competing with one another,” he said. So based on the distance from the city and the size and sheer number of venues the university had at the time, famous acts would come to play three to five times per month—the Allman Brothers used to practice in Tabler Quad; Bruce Springsteen played the Union Ballroom; Jackson Brown played in the Union Auditorium; U2 played in the Pritchard Gym; the Red Hot Chili Peppers, Blue Oyster Cult, Grateful Dead and Bob Dylan also all played at the university. All this music history and influence, Prusslin said, is the reason Stony Brook University was the ideal venue for the Long Island Music Hall of Fame’s founding. It now has grown to occupy a building in Port Jefferson and hosts its semi-annual induction galas at grand locations.